A precocious teenage talent stopped in his tracks by an horrendous knee injury. A regular goal scorer for the reserves, but ignored by his manager. Sent out on loan to Carlisle and Derby, only to return a better and hungrier player. Regularly played out of position for the good of the team and to allow for inferior, less technically gifted players to flourish. But against all the odds scorer of 54 Everton goals in 388 Everton appearances. Leon Osman may not be everyone’s cup of tea, but he is a blue through and through, a devoted Evertonian who in the true Dave Hickson mould, would die for Everton. If Leon Osman’s England caps arrived too late, and they certainly did if you consider that David Bentley, Jake Livermore, Kieran Richardson, Jonjoe Shelvey, amongst many others were capped before Billinge’s finest was finally called up by Roy Hodgson, then the arrival at the Everton helm of Roberto Martinez has certainly come at the wrong end of Osman’s career. 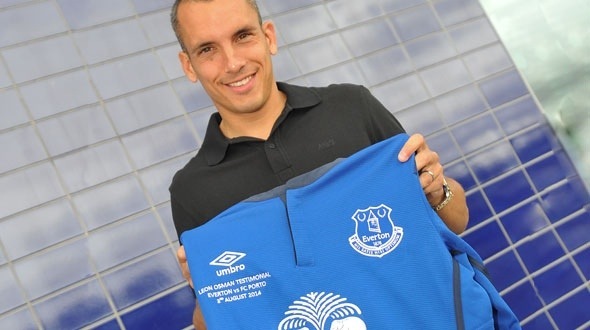 If any ‘British’ player was born with the natural gifts to play the Martinez way it would be Leon Osman. Criminally undervalued and under utilised by David Moyes and a succession of England managers, Leon Osman possessed the trickery, eye for goal and ability on the ball to have led Everton’s central midfield throughout the majority of the Moyes era. Often sacrificed on the right or left of the Everton midfield, Osman always lacked the pace to be a success on the wing and he regularly became the scapegoat for the success starved Evertonians. The FA Cup final of 2009 was a case in point, when Moyes played Leon out on the right alongside Tony Hibbert, only for the former Academy duo to be outclassed by the then world class pair of Ashley Cole and Florent Malouda. As he lines up for his richly deserved testimonial against FC Porto, I will remember the great and often important goals he scored for the Blues. His first away at Wolves in his first start for the club, the two he scored against West Brom at Goodison that helped propel the team towards a fourth place finish and the two he scored later that season at Villa Park in one of the Blues best away performances of the Moyes years. The wonderful finish against Larissa in the Uefa Cup, which ended a fabulous team goal was probably his finest but he has a number of other great goals to choose from including screamers against Manchester City and away at Macclesfield as the Blues started out on the Road to Wembley.